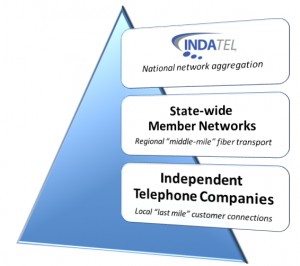 One of the more unique operators in the US Ethernet transport infrastructure space is INDATEL Services, which sits atop a national collection of statewide member-owners fiber networks. Both INDATEL and its member companies have kept a relatively low profile throughout the waves of consolidation that have swept the fiber space over the last decade. Yet with the demands of 5G and other next generation technologies looming on the horizon, the infrastructure INDATEL aggregates is of increasing interest due to its deep reach into rural America. 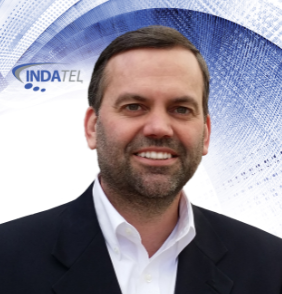 With us today is INDATEL CEO Mel Wagner, who joined the company in 2013 and took over as CEO a year and a half ago. TR: How did INDATEL get started, and how did it come to be what it is today? MW: INDATEL actually started as a trade association or consortium, with like-minded individuals of three statewide networks in Wisconsin, Missouri, and Texas collaborating at industry shows. These three CEO’s started “Independent Alliances Telecom” Group known as INDATEL, as a nonprofit organization with 15 statewide charter members to pool their common interests and to help market those statewide assets on a collective basis. The primarily objective was to leverage the power of scale to purchase peering and transit types of services for these statewide networks. One of the first carrier Ethernet services installed was a 20MB circuit between Big Sky, MT and Cape Girardeau, MO connecting two medical facilities. There wasn’t a single carrier that could provide a cost-effective solution, INDATEL provisioned utilizing two statewide networks and two RLECs while aggregating through the Chicago PoP. To the customer, it appeared as a single carrier, single NOC, single invoice and a ONE stop shop. The Ethernet connection has been in service for years and is solid and works all day long. The first national aggregation PoP in Chicago was established in 2010. That's was also the formation of for-profit INDATEL Services, LLC. So today to a membership of 30 member companies, 20 members are equity owners in INDATEL Services. Those 20 member-owners are in turn owned by several hundred rural local exchange companies. So what we say is ‘one to many’, because at the grass-roots level we are owned by six to seven hundred rural independent telephone companies. TR: What services does INDATEL focus on? MW: The initial core service for our first router in Chicago was the aggregation of direct peering. We have been able to expand the network from one national aggregation hub to six, with more on the horizon. It was getting those direct connections to Netflix, and Google, and all those big peering partners for whom small operators out there in Montana or Kansas or Ohio didn't qualify for. As a national aggregation player, INDATEL was able to get those direct connections and provide lower cost peering services over more expensive transit services. Those tables have turned a bit with transit prices driving toward zero. So today our members connect to the INDATEL national network at one or more than one of those national aggregation hubs. In addition to the peering and accessing scalable, volume-based lower priced services, the overarching objective or goal is for INDATEL to bring national opportunities to the doorstep of members that, more than likely, they couldn't garner themselves. For example, our signature account today is USDA. Over the last year and a half, our network has been servicing and turning up locations for the USDA throughout 22 states. We're typically migrating those locations from common T1 services to minimum 10 MB Ethernet, mostly via fiber connections and procuring mile and last mile network from our state-wide and RLEC ownership and members serving rural America. TR: What does your infrastructure look like today? MW: Our overall mission is serving rural America via urban aggregation PoPs where we hand traffic off to national customers and other carriers. We use our members’ fiber or a third-party carrier to those urban areas. We own all the layer 2 and layer 3 equipment in our aggregation PoPs. We also connect these aggregation PoPs in order to hand off relative to where our members and customers are located throughout the domestic US. We have members/owners from New York to California, and Texas to Minnesota representing 100,000+ miles of fiber, and those individual statewide networks all meet INDATEL at one or more of those aggregation POPs with a minimum of a 10-gig connection. We also continue to expand the INDATEL network of network partners and affiliated suppliers. TR: How tightly integrated is that infrastructure? How closely do your members coordinate? MW: Since 2013, when INDATEL established a significant business plan with additional capital and hiring more resources, we’ve been growing this one nationwide network. INDATEL is one to many of these individual independents, but it's also the power of one when it comes to knitting this together. We structured one master service agreement that all the statewide networks use, so there is one service-level agreement, one contact for quote, one invoice, and one NOC. In the last year we have developed a single, national, flat-rate pricing matrix into four zones throughout the country, which has produced a lot of interest and revenue generating opportunities and increase approach to doing business with INDATEL. What we've been able to do is even provide national bundling to an RFP that might include 20+ states. TR: What challenges have you faced in putting it together across such a diverse group of statewide networks? MW: Developing it wasn't quite as hard as we thought, but the challenge is that 80% of those last-mile network providers are operating under tariff-types of rate structures, which is hard to bend into a national type of pricing matrix. We have identified 300,000+ member serviceable buildings. We are working with our members daily to enhance and identify serviceable buildings, we could realistically approach a One Million member serviceable building list within the next year. Each of the statewide networks has engineered its network a bit differently, but connecting the dots or characterizing the network has been a challenge but bottom-line the INDATEL network is certainly Metro Ethernet Forum (MEF) compliant. Each member is essentially a microcosm of what INDATEL’s doing on a national stage: trying to provide scale in transit and peering by aggregating on an intra-state basis, and to sell the last mile assets of their member-owners off for statewide accounts and such. For some of our members, we are the national sales arm that can bring them opportunities to sell their last mile assets and network to national or regional accounts. Other members do have their own wholesale groups and enterprise sales teams. TR: How does a new member join INDATEL? What criteria do they have to satisfy? What parts of the country are you looking for members in? MW: The hardest part is that it does take some unique and like-minded individuals and independent players who bring together a common thinking for the long-term benefit, and in some cases survivability. Some of these statewide networks have been effectively put together by former consultants who understood the process, but other times they don't know how to go about bringing themselves together. And, of course, we have a model of that via a number of other statewide networks. At a recent conference, we talked with some of RLECs that were attending from states like Mississippi, Alabama, and Florida, in the Southeast where we are thin. We are just beginning that process and educating them on what INDATEL has done and are doing. At the end of the day, it boils down to what opportunities that we can bring to their doorstep, whether it’s to help them generate revenue off their current assets or to enhance their network to service additional sites that they couldn't get to today. Once you start talking dollars and cents with some of these RLECs, then more interest starts to develop in putting themselves together as a statewide for-profit network. Telecom associations generally can also qualify under our operator agreement as a non-ownership affiliate type member. Basically, we're looking to promote the values and the objectives of INDATEL, which is rural in nature, rural by design, and rural in fabric. TR: How does INDATEL view the ongoing consolidation efforts in the industry? How does M&A among your members-owners affect INDATEL? MW: We look at that each time a member is involved in a roll-up, acquisition, or merger, because they still have to qualify to be a member under our operating agreement. For example, when FirstLight bought ION and Sovernet, and then also Finger Lakes Telecom Group, that was an ideal situation where it supported an expanded INDATEL footprint within New York and crossed over into other states. Their ownership structure was and still is independent telephone companies, so for INDATEL there was no change other than the name to our national network map and adding more miles of rural fiber. On the other hand, when Consolidated Communications bought Enventis, they no longer qualified because their ownership structure was no longer independent telephone companies but sill a valuable network partner for Ethernet transport services. But all the while, our Members do a very good job of growing their footprints organically to serve Government, Wireless and Enterprise customers. TR: Where are you focusing your efforts today? Where do you see the best growth opportunities? MW: We foresee methodical growth of the network itself in terms of connecting national customers to one or more of the members-owners for last mile fiber. We are continuing to add or are adding to our portfolio of services benefiting our members, as well. But even as late as 2013, some 97% of our revenue was coming from serving our member. But today, it’s about an event split between revenue from members and sales from ‘outside the family’. The newest service that we've rolled out is what we call the Secure Exchange Cloud. Getting enterprise customers and our statewide networks members lower cost, volume-based pricing for direct, dedicated, private-line connections to Amazon AWS, Microsoft Azure, Google Cloud, Salesforce.com, etc. We have favorable nationwide pricing that can save customers money while also providing a more secure connection to these business critical services. For example, we are providing direct connections to cloud providers from rural North Dakota through our Chicago & Ashburn PoPs via our North Dakota statewide member-owner. TR: How hard was it to get that off the ground with your member-owners? MW: It took almost a year to stand it up and out the door to garner our first order, but mainly that was an education process. But now the light bulb is clicking on and members are really seeing where the value is and including in their statewide RFPs. Today, over 96% of enterprises are using the cloud with over 77% of the business critical workload traversing the big 3 three (3) in Amazon Web, Microsoft Azure and Google Cloud. Simply put, dedicated connectivity to the top cloud providers should be an essential component of every enterprise business case and solution. TR: Are you looking at new technologies like SDN and SD-WAN, and how would your member networks approach coordinating at that level? MW: SD-WAN is the next business case we are tackling, but it is at early stages. Customers are expecting more dynamic bandwidth capabilities, less capital intensive deployments, more software-defined, and we want to basically overlay those abilities onto the INDATEL network. But to really be serious about moving forward on a national network that can compete against the biggest players, our network between the states needs to be transparent. This solution on a national network platform could easily provide cost effective, critical and dynamic bandwidth options for our members, network partners and customers. More to come on this moving into 2019. TR: What do you wish the broader market understood better about INDATEL? MW: I think there is a misperception of INDATEL as a ‘reseller’. Even though we are often selling assets of our member-owners Ethernet transport services that traverse our members’ networks, once I explain in more detail and also show folks our national network impact map, our ownership structure, how we're built, and how we connect, they recognize how our approach differs. We're a member-ownership group of statewide networks representing, as mentioned earlier, almost 700 rural local exchange carriers, and we are able to connect those dots through a single national network.